The State Flag of Maryland features the coat of arms of George Calvert (Lord Baltimore), the colonizer and founder of Maryland. It serves as a symbol of honor, heritage and regional pride and is displayed at state buildings. 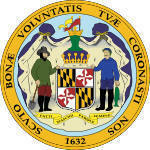 The Maryland State Flag is also flown on national and state holidays and on any other days proclaimed by the governor. There is a strict Order of Precedence for flags. State Flags are displayed in order as they entered the Union. Car Flags are often displayed to represent of an individual's allegiance to their state. Maryland State car flags are used by their owners as mobile emblems of their home. Car flags are usually made from strong materials and are attached to a car via a pole and clip window attachment. What is the design of the Maryland state flag? The design is based on the quartered coat of arms of George Calvert (Lord Baltimore) who is credited as the colonizer and founder of Maryland. What is the history of the coat of arms? 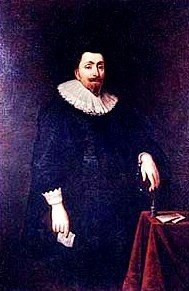 The geometrical gold and black arms represent the Calvert family. In heraldry this shape is described as a Lozenge. The lozenge is a diamond-shaped figure that is set diagonally. As Calvert's mother was an heiress, he was entitled to use both coats of arms in his banner. Who designed the Maryland Flag? 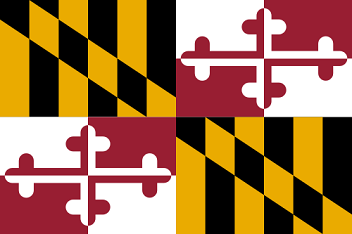 What is the history of the Maryland State Flag? 1880: The flag in its current form was first flown on October 11, 1880, in Baltimore at a parade commemorating the 150th anniversary of the founding of Baltimore. The Maryland flag is kept and used as required by the code specified in the constitution of the state. Official Nickname "Old Line State"